Generally a bit of pontificating, sometimes about nothing, often about something. Indeed, what is next? What comes after you decide to make those big changes in your life? You buy the self help books, you listen to the counsel of friends and loved ones, maybe even your family if you’re lucky enough to hold your family in high regard, and you begin the process of Moving On. But oh, which way, how, where to move exactly? Having done so many things that led to the current situation of Less Than and not a little pain, we may not trust ourselves with the decision itself, or have the slightest idea of how to enact it. Who is this new, emerging person, and what do we do with it? How do we trust what we’ve never encountered or encouraged, and in whom do we place that trust if our new selves are really strangers? Haven’t we always been encouraged to avoid strangers and give them a wide berth? Maybe so. And now comes the great Now What? I want you to know, person to person and soul to soul, that it’s really true that a lot of what I spout in this venue is words to myself – what I need to hear. There was an ancient episode of MASH, in which someone turned to Hawkeye Pierce and said something like: You’re really good at solving everyone else’s problems. It keeps you busy not having to deal with your own! Ta Dah. I have always found it extraordinarily easy to pinpoint “everyone else’s” issues – to see what they needed to do to find their way out – advise them profusely if they cared to ask, (maybe even if they didn’t) – but in true Hawkeye fashion, my own life was mired in my own flights, or crashes and burns, of fanciful pursuits of the unobtainable. Now don’t get me wrong. I’m not saying that Nothing’s Impossible, at least when it comes to personal quests of betterment and tackling dreams and goals. What I’m referring to is the hitching of one’s star to a lowly wagon of Less Than that comes with a broken down horse belonging to someone who fails to offer you what you WANT, and what you NEED. You keep putting more nails in the rotten wood of the wagon held together with baling wire and maybe even duct tape, and keep footing the feed bill of a horse that long since needed to go to pasture, and you keep “believing” in a cause that defies reason. (Ah, Heart and Mind, again….. forever at odds.) Comes the time when you have to wake up and smell the Columbian Latte and deliver the swift kick to your own personal behind. Stop it! I offer up this scenario because just last night I had occasion to delve deep into my old computer to complete some job at hand, and found myself face to face with some archived emails and writings that knocked me off, or maybe really ON, my pegs. I mean they could’ve been written weeks ago, (truthfully, even days? ), and it was the same stuff I’ve been bemoaning for years. I carried the torch of unrequited fulfillment for so long I should have a statue commemorated in my name, but it would best be a monument for what NOT to do. How can I be of such help and solace to so many, and so dishonest to my own self? There’s a question to ponder. What, et tu, Hawkeye? Damn. It was all for Love, I said. I can do anything with the power of my love, I said. Anything’s possible. It can happen, it will happen. Ha and double Ha. OK Queenie, time for a reality check. Well, some things are possible. Some things are doable, even miracles of your own making, but they have to be for YOU. Of and by and for You. Be your own Declaration of Independence, and quit squandering your gifts, your talents, even your Love, on those who value it not. What is that old saw? Cast not your pearls before swine. Well, I happen to like pigs, and most all animals, but I weary of muddying my turquoise nuggets in the cesspool of Love which has been blasphemed and devalued. Enough already. For all of us. It’s so ridiculously true – we do have to love ourselves first and foremost before we can gift that love, and ourselves, to someone who is willing to accept it, and treasure it. Anything less, or more, is downright sad and wrong. And I’ve had to walk a lot of miles carrying a lot of weight to get to the point of discovery. Maybe you will, too. We all have to experience our own “version of the truth” – (another line from a great chick movie) – before we are ready to accept it. And it hurts. Oh well. Maybe we will continue to NOT accept it, and may I tell you now that you will continue to hurt, with little or no hope for getting past that. What a dreary prognosis, but true. And so dear readers, (and self), do yourself a favor and heed these words. Take care of yourself. Love yourself. Be who you are. There are platitudes aplenty written by those far wiser than I, but we all “know” the eternal truths, even as we might choose to close our eyes to them. Do so at your own peril. Oh maybe that’s too dramatic. It’s simply your choice, and mine. We can live in a foggy reality of unfulfillment and pain, or we can strike out for a new shoreline. Why not? Why indeed not? I’m ready to trade in the lumbering, rotten wagon for a newer model, and a horse that is a worthy steed. And I’m looking for a new shining star, and maybe I’ll just name it and claim it for myself: Queenie the Magnificent. Which one is your star? 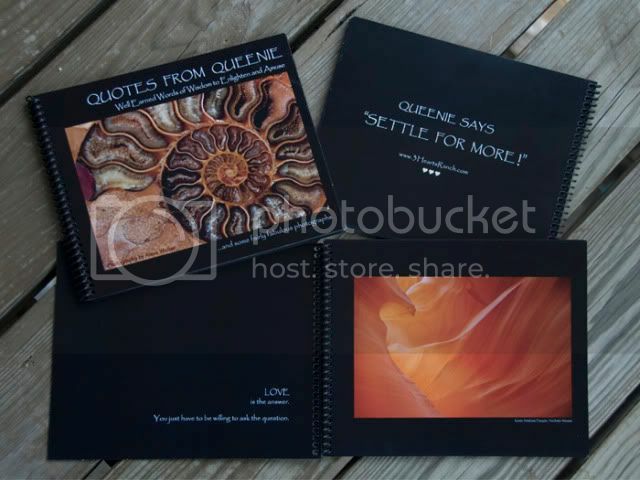 Queenie's book is available via this blog or check out Queenie's Favorite Photographer's website (www.3HeartsRanch.com) for details on her art shows to get your own exquisite copy of inspiring words and beautiful images. It makes a wonderful gift for friends who need a bit of encouragement, and that might even mean you. "Quotes from Queenie, Words of Well Earned Wisdom to Enlighten and Amuse...and some fairly fabulous photographs," is here now and waiting for you. Be the first on your block to hold it in your hands. Queenie's Favorite Photographer link just below. Want to be informed the second (or shortly thereafter) Queenie posts another pearl? Enter your email address to subscribe to this blog and receive notifications of new posts by email.